If you want to spend a lot of time outside, Royal Palm Villa is for you. The decor and design is minimal, so there’s nothing to distract from the ocean views. You’ll want to eat all your meals on the dining terrace, especially when you see the view at sunset. There’s a living area, a lounge, and a pool so you can spend as much time as you want staring at the sea! The Royal Palm Villa sits on top of the Vitet hillside, with wide-open views of the sea that come alive at sunset. 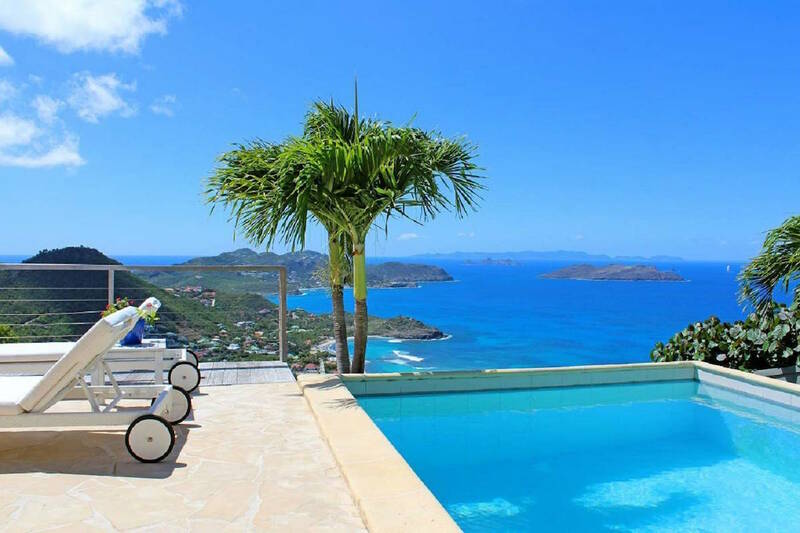 St. Maarten is visible in the distance, and Anse de Lorient is a short drive away. Outside, there’s several places to take in the view. The covered terrace shades al fresco dining, a BBQ grill, and lounging. The rest of the terrace holds the swimming pool and a balcony that looks out over the hillside. There’s surround-sound inside and out, and additional al fresco dining around the corner. The whole house is air-conditioned, and there are ocean views from almost every room. The living room has exterior access and an entertainment system with a flatscreen TV, DVD player, satellite, and a docking station. The dining table sits behind, and the full kitchen opens to a covered terrace. It has a breakfast bar, all white appliances, and a coffeemaker. The two king bedrooms with ensuite bathrooms are in the main house, and each have ocean views and exterior access. The third king bedroom is located in a separate bungalow, with an ocean view, private terrace, and ensuite bathroom. Each bedroom is well-sized and has a sitting area. The house is completely screened. Royal Palm is great for a family vacation or couples’ getaway for anyone who wants an ocean view or private bedrooms. Guests can enjoy daily housekeeping, which lets everyone relax as much as possible. Guests will be met at the airport/car rental area (3rd booth on the left) and guided to the villa by a local representative from the villa management company.